One of the best loved alleys in Tewkesbury, Wall’s Court runs from the High St, by the Nottingham Arms, to Oldbury Road. Mr Wall was a tailor, a ‘respectable man’, who occupied the front house two hundred years ago. 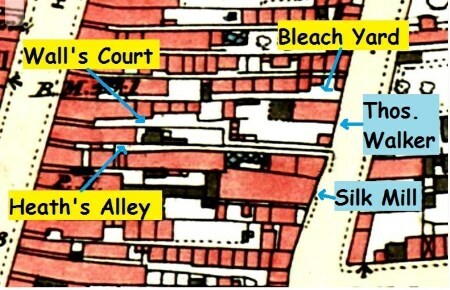 As the ‘Court’ name implies, this alley had no right of passage when it was given its name. Its route to Oldbury Road doesn’t follow the line of the historic plot, though. It has a kink, crossing to the opposite edge of the plot, where the path sits alongside a now disappeared alley; Heath’s Alley, once entered by the doorway alongside 131 High Street. Another idiosyncrasy of the court is that the houses were on both sides. The norm is that alley cottages are behind the ‘front house’, with a blank wall on the other side. These two features suggest that the plots behind 129 (the Nottingham Arms) and 130 were in common ownership. The double plot at the Oldbury Road contained a building at the end of the nineteenth century, and this is likely to have been the case for many years before this. In 1875, Thomas Walker, famed for fairground rides, bought this area, described as a ‘Warehouse and yard ‘, together with five adjacent cottages in Bleach Yard, from Charles Bolton Edgecombe, for £460. This was his first venture, followed in 1882 by expansion into the old silk mill, standing behind the Wheatsheaf, more or less where the Ambulance Station now sits. Walls Court contained six cottages, most of which were behind the Nottingham Arms. Eventually, with Council pressure, a row of four toilets was established. In1890, Mr Morgan complained about the state of the paving, and the Council offered to repave it ‘if the owners would ‘throw it open to the public and abandon their claim to keep it as a private court’. They agreed, it was paved with blue bricks and became a right of way. The cottages certainly weren’t palaces. In 1926, Mr Badham bought two for £100. In 1938, an order to demolish five houses was sought and approved. Things moved slowly, though, and in 1940 the houses were reprieved and reconditioned to provide urgently-needed wartime accommodation. This was a temporary measure, though, and the clearance was eventually carried out, with the exception of two which were incorporated into the Nottingham Arms. On the other side of the court was a different class of house; a large fifteenth century timber-framed building. This was a high status house, suitable for a private Court, but out of place in an Alley. The garden had been partially developed in the twentieth century, with a building for Crouch’s bakery. This house fell into the hands of Whitbread Flowers brewery, who used it as a bottle store for the Nottingham arms and completely neglected its maintenance. In 1970 their architect, Mr Lachlan, declared it unsafe and uneconomic to repair. They applied to the Council for consent to demolish it, which was challenged strongly by the Civic Society. After two failed planning applications Whitbread Flowers gifted the building to Gem Town (Tewkesbury), a charity established to restore local historic buildings. Gem Town also acquired the bakery, and after a restoration which took ten years the whole site was sold for residential use. The house is now called the ‘Tailor’s House’, harking back to Mr Wall’s profession. Later, during an upgrade, the Nottingham Arms was extended to occupy the space which was once cottages. When manufacturing finally left the space beyond the ‘kink’, more cottages were built, to repopulate the court.